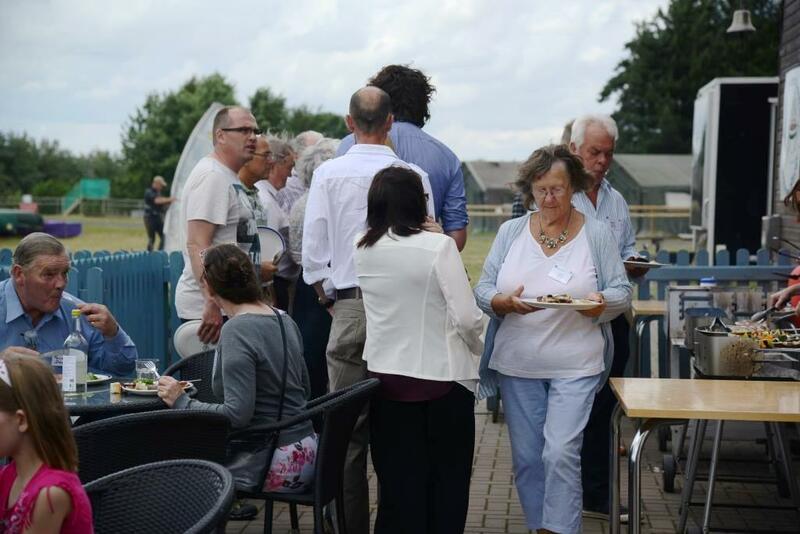 About 80 people - Aymestrey Old Boys, staff members, parents, friends and their families - enjoyed an afternoon of celebration, remembering and catching up with old friends. 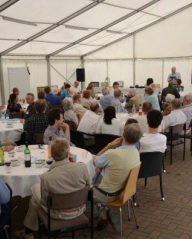 The reunion was held in a marquee on the edge of the lake at Top Barn Activity Centre, Holt Heath, which was made possible with the very generous support of Di and David Harper of Top Barn, parents of 3 Aymestrey Old Boys (1982-1990). 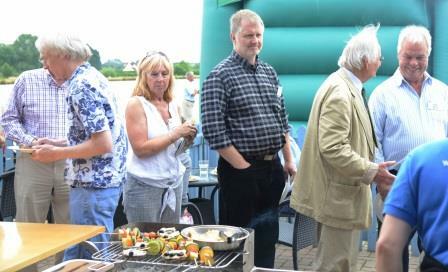 On a warm day of mixed sunshine and heavy showers people started arriving about 12.30 for a BBQ lunch served from 1pm. The showers held off long enough to allow the children to work off some energy on the bouncy castle, and everyone to get their lunch. 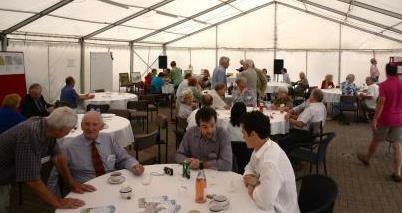 There was also the opportunity to socialise before the formalities started. Top Barn organised an afternoon of activities for the children (archery, shooting and zipwire) while the adults listened to a few speeches (which were made more difficult at times by having to compete with heavy rain on the roof!). 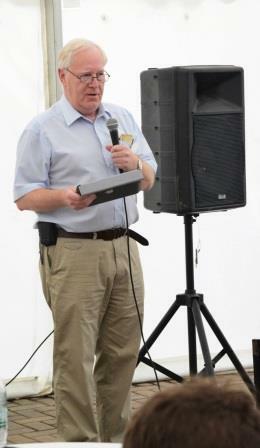 John Chandler (1956-61 and Staff 1971-72) was Master of Ceremonies for the afternoon. 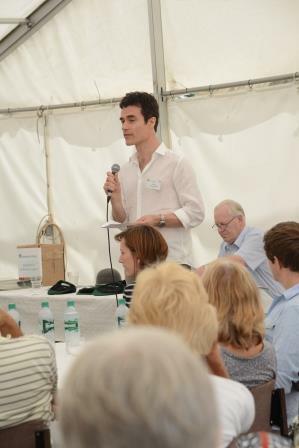 He was also the second of three speakers who talked about their time at Aymestrey and what it meant to them. 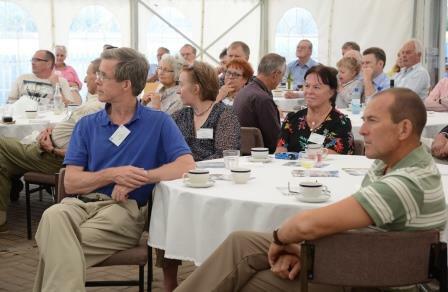 John talked about his time as a pupil when DAN Asterley was headmaster, and when he was on the staff after Hugh Griffith had taken over, and DAN was still teaching. (1947-52) spoke first, about how important Aymestrey's influence was on his life. He remembered both Mr Mildmay and DAN Asterley. 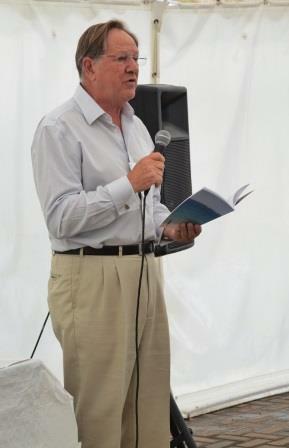 Richard Blair-Oliphant (1975-80) remembered his grandfather Nigel who often spoke at Aymestrey events; and spoke about his time at Aymestrey under Hugh and Gill Griffith. 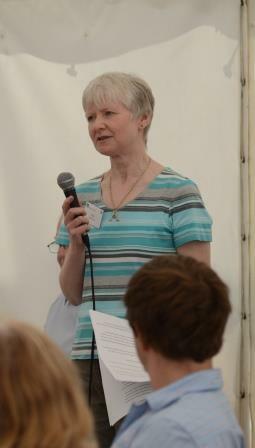 Pippa Griffith thanked all the people who had helped to make the day, and this website, possible. 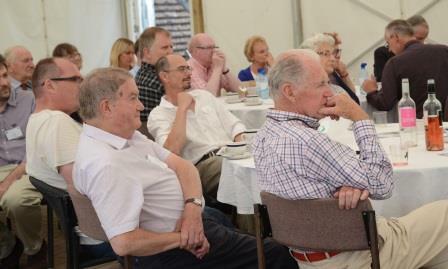 She talked about the various displays around the marquee; and some of the interesting things she had discovered during her research into the history of both the building and the school. 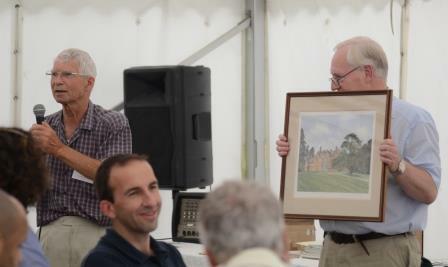 The formalities concluded with an auction of a print of the Aymestrey building by local artist Ronald Swanwick. 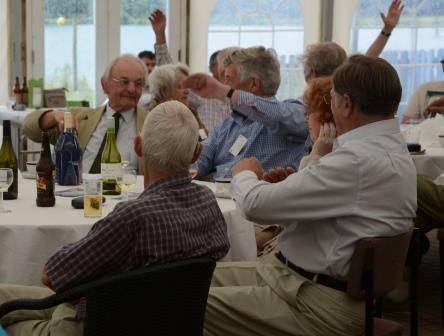 Philip Baldwin (1948-54) dusted off his auctioneering skills and persuaded Richard Blair-Oliphant to part with £140 to be donated to a school Sarah Griffith is supporting in the mountains of Haiti. Various items of memorabilia (caps, school magazines and prospectuses, photos etc) were available on the day, in return for donations to St Richards Hospice. These, together with copies of the promotional video donated by Jon Essex, raised £120. St Richards was supported by the school over the years, and co-ordinated Hugh Griffith’s care before he died. Left: Tom Murphy (1987-91) with a copy of the last school prospectus. 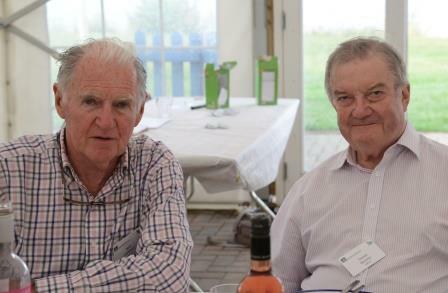 As well as those shown here there were Old Boys from every year between 1939 and1992 (apart from 1955); and 3 staff members. This link will take you to their photos. Mr & Mrs Emson (1986-89). On their way to the reunion a group of people visited the Aymestrey building at Crown East, with the consent of the new owners, and had a look around the grounds and at the work being done on the building. 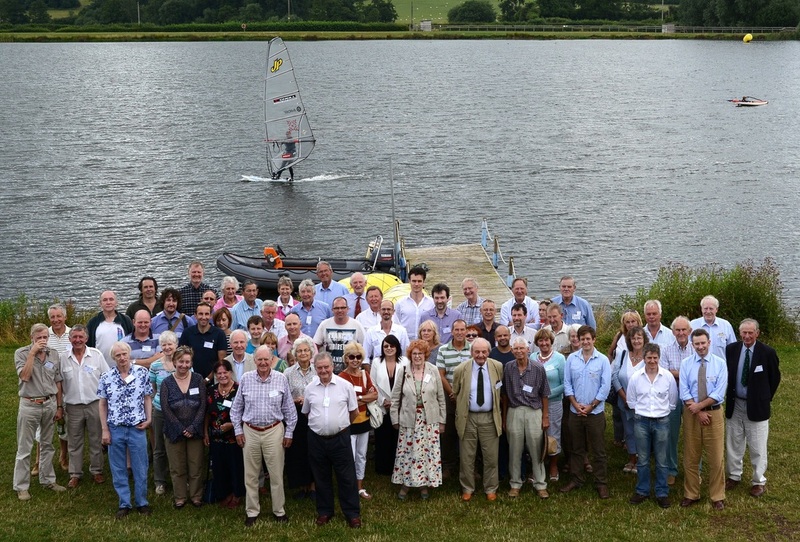 A second group visited following the reunion. Thanks to Mike Bews for the photos.